Many people know of my interest in the release of information through the Freedom of Information Act by the Nuclear Regulatory Commission. In October 2014, I participated in a meeting with Dave Lochbaum of Union of Concerned Scientists, Lawrence Criscione (who works for the Nuclear Regulatory Commission, but was participating in the meeting as a private citizen), Tim Judson of Nuclear Information Research Service, Jim Riccio of Greenpeace, Paul Gunter of Beyond Nuclear and the NRC Staff. During that meeting each of the participants presented their concerns with how the NRC was interpreting certain FOIA rules. My particular concerns that I presented at that meeting pertained to documents released relating to the Fukushima Daiichi nuclear disaster. After that meeting, a group of participants (Lochbaum (Chairman), Judson, Riccio, Gunter, and Hixson) determined to form an official committee to interface with the Nuclear Regulatory Commission on FOIA-related activities. That is how in December of 2014 the Freedom of Information Team (FIT) came into being. On July 31st, 2015, I emailed Dave Lochbaum about a FOIA request that I hoped he would submit for me. I had come across some information from Kenji Tateiwa, who is the Nuclear Power Programs Manager at Tokyo Electric Power Company (TEPCO), the utility which operated the Fukushima Daiichi nuclear power plant. Tateiwa graduated from Kyoto University in 1996 with a BS/MS in Nuclear Engineering and was immediately hired by TEPCO. Before the Fukushima Daiichi nuclear disaster, Tateiwa worked at the Fukushima Daini nuclear power plant, then was transferred to Tokyo to work at TEPCO’s severe accident analysis branch of the Nuclear Engineering Department. In 2010 Tateiwa was part of the TEPCO delegation that pursued investing in new nuclear reactors in Texas. Tateiwa was in Tokyo in the early days of the Fukushima Daiichi nuclear disaster, translating TEPCO press releases from Japanese to English, meeting with the EU delegation and the NRC. He was also present at a very important meeting on March 27th in Tokyo between NISA, INPO, and the NRC. He participated in the IAEA Preliminary Fact-Finding visit to the Fukushima Daiichi plant in April 2011 and May 2011. In June 2011 he was at the private residence of U.S. Ambassador Roos trying to reinforce ties, and in August he was aiding the INPO-led support team at Fukushima Daiichi. 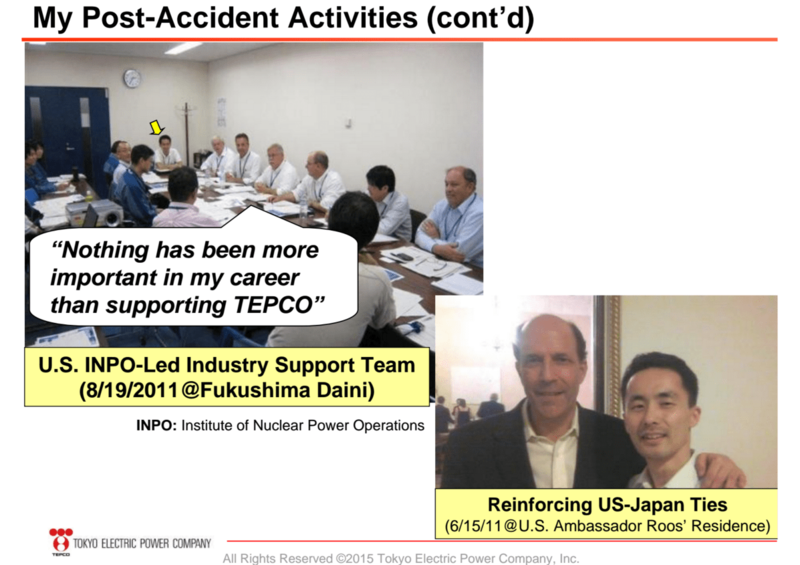 By September 2011, Tateiwa was transferred to the TEPCO office in Washington D.C. I felt that there was much that the public could learn and benefit from a better understanding of what Tateiwa knew and when and what he relayed to the NRC and when, so I asked Mr. Lochbaum to FOIA for all communication and materials transmitted between Mr. Tateiwa and any member of the NRC. No response was ever received from the NRC. On December 8th, I emailed Dave and asked if he had ever gotten a response. He replied and told me that no, in fact the NRC had not acted on the FOIA request, potentially because of a defect with the FOIA request system at the agency. On December 9th, Dave emailed the NRC and informed them of the oversight and requested that they follow up on the FOIA request. He received a reply from Karen Danoff, a Government Information Specialist at the NRC, acknowledging receipt of the FOIA request. Dave received an email from Karen Danoff again in the afternoon of Monday, December 14th. In that communication Dave was notified that there could be “hundreds, or possibly thousands, of email” and they asked whether we could limit our scope to narrow down the number of documents that we would receive so they could save staff time and resources. Dave was puzzled, after the Fukushima Daiichi nuclear disaster, several individuals and organizations submitted FOIA requests for essentially any and all records related to the event. Seeing as Mr. Tateiwa served for a long time as TEPCO’s representative in Washington, as liaison to several post-Fukushima inquiries, and was such an important part of integrating with TEPCO, Dave had assumed that most (if not all) of the Tateiwa e-mails had already been released and our request would only bring a handful of new e-mails to light. In no way did Dave expect that “hundreds, or possible thousands” of records to/from Mr. Tateiwa could have avoided having been released during these many prior FOIA requests and releases. Clearly, previous FOIA requests by other organizations and individuals encompassed emails and should’ve included Tateiwa’s records, but when Dave searched the NRC ADAMS database, he could only find ten records – six of them being FOIA responses. Dave requested that the NRC not limit the scope of the FOIA request and to make all documents requested available. This morning he also sent an email to Hubert Bell, Inspector General of the NRC, asking him to look into potential NRC staff wrongdoing by not releasing some, if not all, of these records in response to prior FOIA requests. Mr. Lochbaum’s concerns are that either the NRC program office is lying now about the inventory of unreleased records to/from Mr. Tateiwa in their possession, or that the NRC violated federal FOIA law by failing to release some or all of these records in response to numerous prior FOIA requests. You can bet that we will be watching these events develop closely.